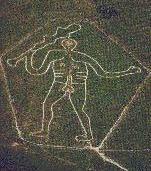 Here's just one photo -- not taken by me -- of what may be Britain's rudest public monument: the Cerne Giant (also called the Cerne Abbas Giant). The Cerne Giant has been waving his weapon, thrilling tourists and frightening the horses for many generations. Admittedly he's much less elegant than Uffington White Horse, but he's easier to see and much more arresting. A man on a grotesquely large motorcycle rushes away from the Giant in an ad published in the "September" (August) '99 issue of Britain's Top Gear magazine. Is he inspired by the Giant, frightened by him, or just bashful? You could be excused for confusing the speedo and the tacho as the needles fly round so fast. The horizon flies towards you so fast that it's hard for the brain to cope. This really is one hec of a quick bike. 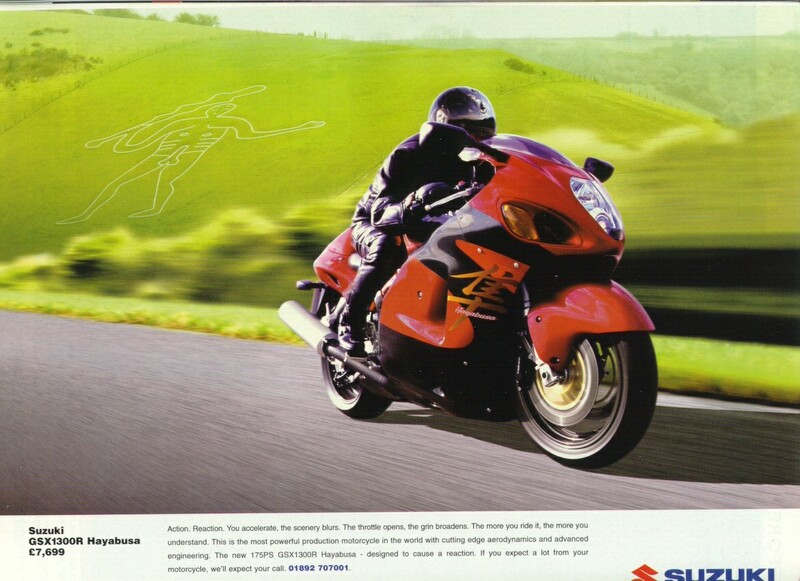 There's more power and torque than you could ever use. . . .
Well, it's cheaper than a Zonda. But when it rains, you'll get wet. And if it falls over, you'll wish you'd been riding a Super Cub instead. 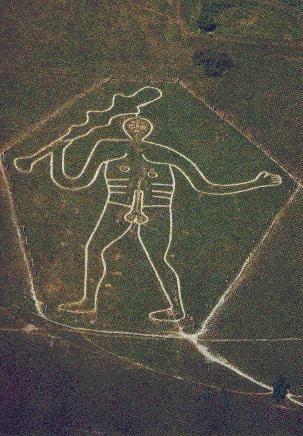 I'm grateful to Dr Mark Hows for his permission to use this image from his excellent page -- http://www.homeusers.prestel.co.uk/hows/personal/hillfigs/cerne/cerne.htm, now defunct -- on the Cerne Abbas Giant. First created: 31 August 1999. Last fiddled with: 6 April 2001. I haven't had this page checked by censorware; prolonged viewing may cause blindness and/or insanity.